Avis Budget Group has revealed its latest campaign – Avis Prestige - Porsche: ‘The Affair’ – created by Collective London. The integrated campaign spanning OOH (out of home), Digital, Social and In-station communications across the German language countries, is the first campaign by Collective since the agency’s appointment as lead creative agency for the Avis and Budget brands internationally. 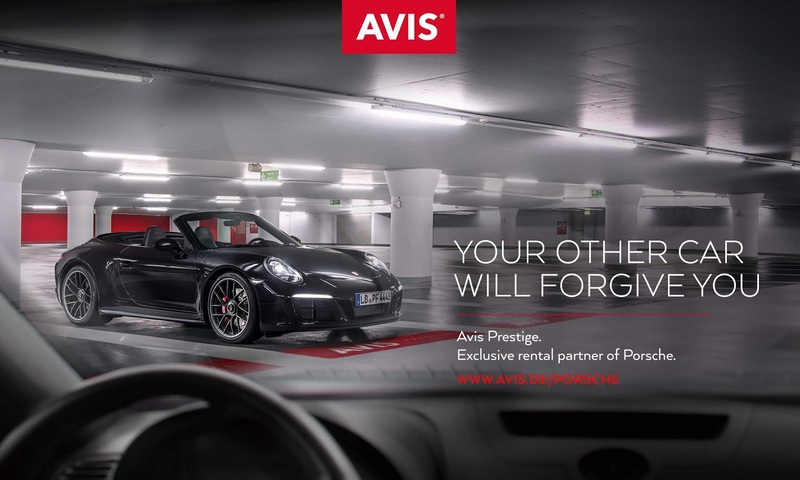 The campaign, which was produced in just three weeks following the appointment, has been created to promote Avis’ relationship with Porsche; Avis is the exclusive rental partner of Porsche in Germany, Switzerland and Austria. Featuring a playful tagline: “Your other car will forgive you”, the creative retains the sense of luxury associated with Porsche but reinforces its accessibility through Avis. Collective London was appointed lead creative agency for the Avis and Budget brands across EMEA and APAC following a four-way competitive pitch. The other agencies that pitched were incumbent VCCP, Founded and Will London. Following the initial campaign Collective London will be working with the Avis Budget Group on a series of new campaigns to ensure the Avis and Budget Brands are clearly differentiated in an increasingly crowded international market.